My role-playing game of choice for many years, on those rare occasions when a group of us old friends can engineer a break from our busy lives and organise a session (particularly rare now that I’m in another country) is Warhammer Fantasy Roleplay. You’ll find the entertaining diary of our adventures from 1987 to the present here, should you wish to read it. I bought the first version of WFRP way back in 1986 and have forked out for every product in the line since, up to and including the new, and drastically different, version three (though, unfortunately, it seems it’s languishing somewhat these days in its new Fantasy Flight Games stable). The one constant through the various versions of WFRP, however, has been the grim and perilous setting of The Empire, a roughly medieval Germanic fantasy land covered in dark, dangerous forests haunted by beastmen and torn apart from within by corrupt cultists and chaos-tainted mutants. The second edition of the game featured some beautiful maps by one Andrew Law, a talented cartographer whose atmospheric work really should be better known—and whose skills certainly should have been used for the new third edition. Anyway, the point being of this ramble is that Mr Law has recently decided to recreate the entire Empire using Games Workshop’s plastic Mighty Empires’ terrain tiles, an enormous and frankly pretty crazy endeavour, but a gloriously ambitious one nonetheless. His progress is documented on his blog Lawhammer! I recently donated a set of tiles to help him on his way (you can read about it here and his dapper rendition of me by way of thanks is reproduced in this post) and already others are donating and bringing him very close to his goal of the 480-odd tiles required. Of course, keep in mind that he has to match the tiles to the actual map of the Empire, so there’s quite a bit of additional modelling required—including drilling river channels—to make the map accurate, not to mention painting them all as well. When he’s finished, it should be an incredible thing of great beauty and wonderfully limited practical application. Sigmar’s blessings upon you Mr Law, go for it! Back in the 80s, a few friends and I, having done the requisite time in our early teens playing Dungeons & Dragons, were looking for a system a little more gritty, ‘realistic’, and ‘mature’ with which to enjoy our roleplaying sessions. And along came Warhammer Fantasy Roleplay with the tagline ‘A Grim World of Perilous Adventure’, which fitted the bill perfectly with its grotty 15th century German-ish milieu. There followed a campaign that, off and on, lasted years, and featured some of the most hilarious and enjoyable moments I’ve ever had with a group of friends. It’s been a good ten years since I did much in the way of running a roleplaying campaign, but with the release of the new 2nd Edition Warhammer Fantasy Roleplay that group of friends is clamouring to get playing again (in between jobs, wives and lives). 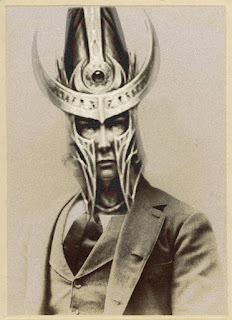 And with the same beloved characters—so pretty soon, the so-called ‘Merry Pranksters’ should once again start terrorizing peasants, cultists and nobility alike: Lucidius Lavarar, a flamboyant raconteur with a preference for polka-dot shirts and fleecing innocents of their money, Alitl Flagelant, a smelly, embarrassing dwarf, Fatuus Fitzue, a shabby, nondescript wizard, and Robert Lacy D’Aghuitlam duCourt, a once-noble elf with a brief drug problem. I was worried the new edition might have seen WFRP‘s distinctive atmosphere swallowed up by the money-making behemoth that is Games Workshop and their kiddy version of the Warhammer World. To my relief however the new book is excellent—well written and well designed, some of the clunkier rules streamlined and, despite a few changes to the background material and history I won’t be using, the atmosphere still thick and—well, grim. The new combat system, while I have yet to try it out, seems smart. It divides the combat round up into half actions, full actions, and free actions, thus forcing the player to think a little more about the options than just “I take a swing at ‘im.” Combat is still very deadly, as it should be, which keeps the emphasis on roleplaying and story. The new magic system seems simple, but introduces all manner of frightening side effects that make magic use dangerous and unpredictable. Everything has been standardised to use a ten-sided dice, and both skill use and combat can easily be modified by an across-the-board ‘easy to hard’ set of standard modifiers. Simple. But WFRP isn’t really about rules, though these are very good. It’s about superior story, atmosphere and character. A new campaign is on the way (along with a Bestiary and Gamemaster’s Pack; two other releases, a Character Pack and Plundered Vaults, a set of mini-adventures, are already on the shelves), and if it’s anything near as good as the old Enemy Within campaign, they’ll be many very enjoyable evenings gathered around a table laughing our heads off to come. There’s nothing like a vivid imagination to keep you from growing up. 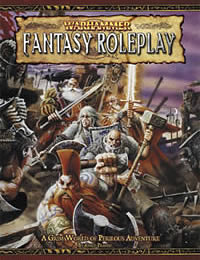 Warhammer Fantasy Roleplay 2nd Edition is available from Black Industries or Green Ronin.